Hull City reportedly make an offer to sign Aston Villa defender Tommy Elphick on loan for the remainder of the season. Brentford forward Neal Maupay accepts a retrospective three-match ban for stamping on Aston Villa midfielder John McGinn. Brentford boss Dean Smith warns Aston Villa that the Bees will launch an appeal of their own if the West Midlands outfit look for retrospective action for Neal Maupay. Aston Villa yet to receive Mile Jedinak offers? 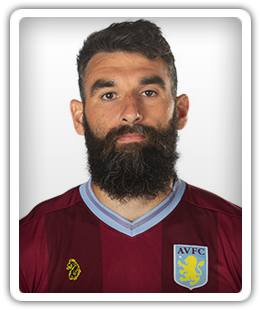 Aston Villa are reportedly yet to receive any offers for Mile Jedinak, who could leave the West Midlands outfit during the summer transfer window. Denmark midfielder Christian Eriksen admits that he is not a fan of VAR, after the system played a part in their 1-1 draw with Australia at the 2018 World Cup. Denmark head coach Age Hareide admits that his players were fatigued during their 1-1 draw with Australia. Relive Sports Mole's live commentary of the 2018 World Cup clash between Denmark and Australia, which finished 1-1. France midfielder Paul Pogba claims that Les Bleus felt like 'they were playing in Australia' in Saturday's 2018 World Cup clash in Kazan. Didier Deschamps admits that France can "do a lot better" following their narrow 2-1 win over Australia in their World Cup Group C opener at the Kazan Arena. Australia captain Mile Jedinak believes that the Socceroos put in an "almighty effort" in their valiant 2-1 defeat to France in Group C of the World Cup. Aston Villa midfielder Mile Jedinak describes the Championship playoff final with Fulham as a "crossroads moments" for both clubs. Aston Villa youngster Jack Grealish hails the impact of John Terry on his own development as the Villans prepare for their Championship playoff final with Fulham. The three captains of Australia, Denmark and France ask FIFA to lift the ban on Peru captain Paolo Guerrero, who is currently suspended for this summer's World Cup. Tony Pulis bemoans the fact that one set play cost Middlesbrough over their two Championship playoff semi-final meetings with Aston Villa. Relive the goalless draw between Aston Villa and Middlesbrough at Villa Park as the hosts withstand a late fightback to book their place in the Championship playoff final. Steve Bruce warns his Aston Villa players not to start dreaming of Wembley just yet despite a 1-0 lead in their Championship playoff semi-final with Middlesbrough. Mile Jedinak's 15th-minute header earns Aston Villa a 1-0 win over Middlesbrough in the first leg of their Championship playoff semi-final. Middlesbrough boss Tony Pulis names an unchanged starting XI for Saturday's Championship playoff semi-final first leg against Aston Villa. Relive Sports Mole's live text coverage of Middlesbrough's 1-0 defeat to Aston Villa, as Mile Jedinak's 15th-minute header earned the visitors victory. Bristol City lose 5-0 to Aston Villa at Villa Park to see the gap on their promotion rivals reduced to just three points. Aston Villa squander an early two-goal lead to draw 2-2 at home to fellow playoff chasers Sheffield United at Villa Park. Aston Villa manager Steve Bruce confirmed that striker Jonathan Kodjia will undergo another operation on a recurrent ankle injury. Sports Mole previews the second-city derby between Birmingham City and Aston Villa at St Andrew's. Sports Mole previews Saturday's Championship clash between Midlands rivals Wolverhampton Wanderers and Aston Villa at Molineux. Jonathan Kodjia is back in the fold for Aston Villa's trip to Barnsley.